Now Works with the Testo Smart Probes App! The newly designed testo 552 now incorporates a Pirani style vacuum sensor. Precise deep vacuum measurements, measuring down to single digit resolutions, are done with Pirani sensors. The testo 552 has real time calculations for the saturation temperature of water, which determines the proper micron/temperature levels at which moisture is removed from the system. These internal calculations inform you when/if the pressure is low enough to meet your evacuation target. This saves time and provides you with the assurance that the system is now free from moisture and contaminants. User defined alarm points alert you when target values are reached. 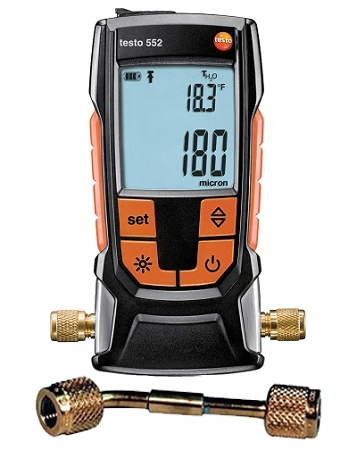 The new testo 552 with Bluetooth links to your smart phone or device. The testo 552 uses the free testo SMART Probes App which is a powerful and easy-to-use tool. It allows you to remotely read measurements of 1 to 6 Smart Probes including the testo 552. You can easily document / report the results. The newly designed Testo 552 is the one of the most accurate vacuum gauge for servicing air conditioning and refrigeration equipment on the market today. Evacuating is a process of both degassing and dehydrating. Of particular interest to those working on refrigeration systems where the box temperature may not be above freezing when servicing is an indication of the saturation temperature of water for the level of vacuum that is being obtained. Comparing the saturation temperature of H2O to that of the box temperature will allow the technician to determine if moisture could be present and or if ice has formed and is sublimating in the refrigerant system, increasing vapor pressure and otherwise indicating what might appear to be a leak. Moisture and or ice in A/C refrigeration systems can cause significant problems leading to catastrophic failure. Trust the Testo 552 to be right. Due to the high accuracy and the quick response of the Testo 552 to leaks, we recommend that you only connect it with vacuum rated core tools and a brass connector as offered in the options above. Also using an assembly lube like Nylog will aid in making vacuum tight connections. Need help with vacuum and evacuation? Go Here. We do not recommend that you connect the gauge with 1/4" hoses inline as shown in some illustrations. Do you want to complete your evacuation up to 16 times faster than with 1/4" hoses and a typical manifold? Typically cut a when might take an hour to 4 minutes? Take a look at the TruTech Tools Rapid Vac Kit. For an extended warranty please register your testo digital manifolds/gauges at Testo.com. 183 TruReward$ points will be placed in your account when you buy this item.